Shape ready-made dough into a rectangle to make this Tomato-Basil Pizza Recipe. 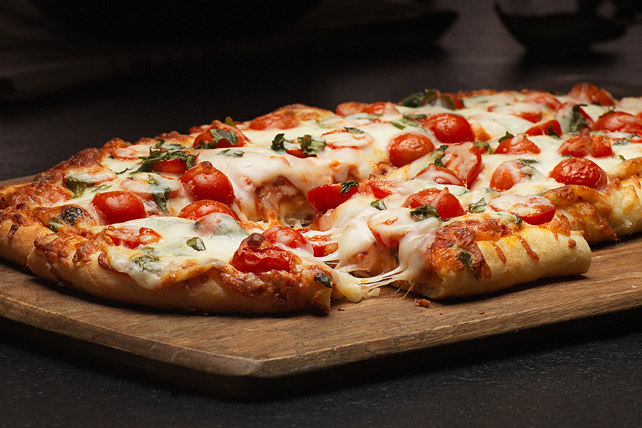 Enjoy the magic of a classic pairing with this Tomato-Basil Pizza Recipe. Pat and stretch dough into 14x6-inch rustic rectangle on baking sheet sprayed with cooking spray; spread with sauce. Top with 1 cup cheese, tomatoes and basil; sprinkle with remaining cheese. Bake 12 to 15 min. or until cheese is melted and crust is golden brown. Serve with a mixed green salad and your favorite fresh fruit.